Too busy at work to clean the house? Having a hard time finding the right equipment to help you in cleaning efficiently? Worry no more as the best aid in cleaning the house is already available, and you can quickly grab it! It is easy to use, works faster and with less hassle Let me introduce Samsung POWERbot R7070. How does the Samsung POWERbot R7070 look? The Samsung POWERbot R7070 is designed in Satin titanium color. It is 13.4″ in width, 3.8″ tall and its depth is at 13.7″. This product weighs 9.5 lbs. Although it looks bulky and more significant than other vacuums, its size does not matter as its features can beat any different kinds of space. How do you program the Samsung POWERbot R7070? This POWERbot R7070 is very easy to program. It comes with a remote control which is very convenient since you can control the vacuum from afar. No need to walk around the whole house together with space. And since it has fantastic automatic features, you no longer have to manually change its settings every time there are changes on the surfaces that you clean. It will automatically change once it detects any slight variation on the surface. And since it has wifi connection feature, you can also connect it to your smartphones and control the product from there. It is straightforward and convenient! Broad brush – the bigger the brush, the more area it can cover which means the faster it can clean! This product’s brush is 11.2 inches wide which is wider than the standard vacuum brushes. The broader brush also means lesser movement for the machine. • Edge Clean Master – since it has broad brushes, some people would think it will not be able to reach smaller areas like corners or wall edges, but the creators of this product have already thought well of the problems experience by a lot of house cleaners. This includes cleaning the hard to reach areas like the corners and edges of the walls. That is why the POWERbot comes with the clean edge master which is a rubber blade that can be extended to reach these hard to clean corners and edges. • Washable filter – no more buying of filters now and then! This is because this vacuum’s screen can be used over and over again. All you need to do is to wash the original one, and it’s as good as new! 40x More Powerful Suction – It delivers optimal cleaning results, it can get more dust and fur than any other vacuum. This means more convenient and faster cleaning! • Intelligent power control – it can detect the kind of surface it is on and automatically changes the ideal suction power for that specific surface. No need to manually change them. Also, it comes with a program that allows you to schedule the cleaning, so you can set a time when it is best and most convenient to do the cleaning. • Visionary Mapping + FullView Sensor – It has a built-in camera and multiple sensors which is very efficient in cleaning many rooms and at the same time in avoiding obstacles such as furniture. You can sit in the living room while the vacuum is in the kitchen and you can still see where it is headed to through the camera. 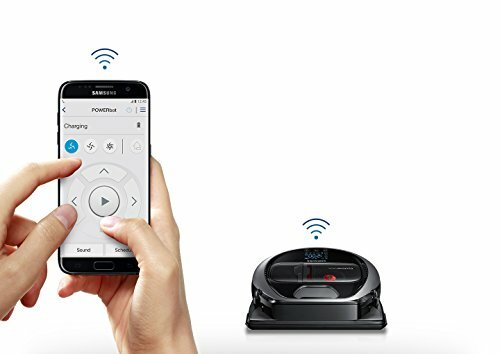 • Wi-Fi Connectivity – you can easily connect your vacuum robot to your smartphone and control it from there through a wifi connection. Aside from smartphones, other voice-enabled devices like google assistant and Alexa can also be connected via wifi and can also control the robot. How does Samsung POWERbot R7070 handle pet and human hair? One of the best features and the unique selling point of this product is the Self Clean Brush. 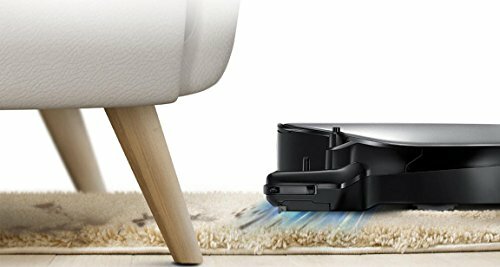 This unique feature makes one’s life a whole lot easier since it automatically removes pet and human hair that are collected around the vacuum brush. No more struggles in removing these small pieces of fur and hair from the bush! How easy is Samsung POWERbot R7070 to use? This product will be the end of all your home cleaning problems. It is straightforward to use and navigate. There is a manual that will quickly teach you how to use the product and how to connect it to your mobile phones or with other gadgets compatible with it. Anyone can use it, even an older adult who cannot stand too long. All they have to do it sit in the comfort of their couches and navigate the vacuum through the use of remote control! This product is beneficial when it comes to multi-tasking as you can do other stuff while the robot cleans your whole house. 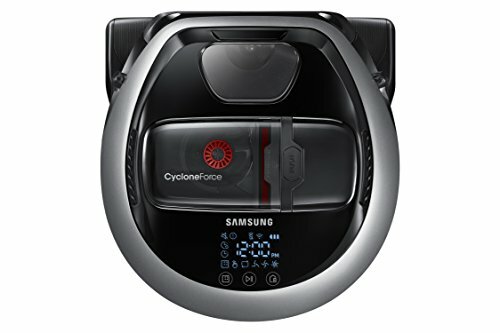 How is Samsung POWERbot R7070 on the carpet? Since it has different modes of suction control, it is suitable for both hard floor and carpet. 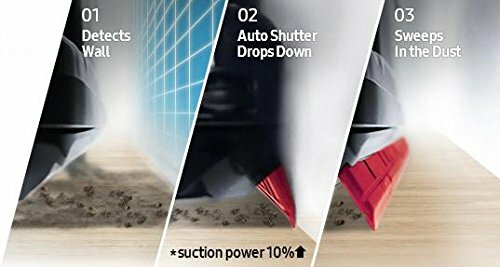 And with its intelligent power control, you no longer need to change the suction control when cleaning the carpet manually. Once the robot detects that the surface it’s cleaning is broken, it will automatically look for the best suction control for that specific surface. How is Samsung POWERbot R7070 on wooden floors? Unlike other vacuums that are only specific for carpets or floors, this product is suitable for both! It can easily clean wooden floors by switching its suction control. Admittedly, all these fantastic features will make you want to out your hand on this POWERbot as soon as possible! If you would like to purchase one, click the link below now! Indeed, technological advances are making everyone’s lives more comfortable and more convenient. And this product is one of the best examples for that. So what are you waiting for? Get one now! Strong suction on every surface - Good for pet owners!